Maspalomas is the world-renowned tourist town at the southernmost part of Gran Canaria. Completing the municipality of San Bartolome de Tirajana, its coast welcomes more and more visitors each year. With endless sand dunes, upscale hotels, and lovely beaches and attractions, it has perfected the equation for a desirable European destination in the Canaries. Faro de Maspalomas, the town’s famous lighthouse first lighted the ocean over 120 years ago. Due to the lack of roads accessing the area, the government decided first to build a wharf, and then ship the materials for the lighthouse. Since then, the romantic and historic lighthouse has been an inseparable landmark of the town. The hotel-lined Maspalomas today is the result of an ambitious vision to create a resort town that would stand amidst the dunes and the Atlantic. The rise of the lighthouse, followed by the expansion of resorts ultimately led to Maspalomas as the top tourist destination on the island. 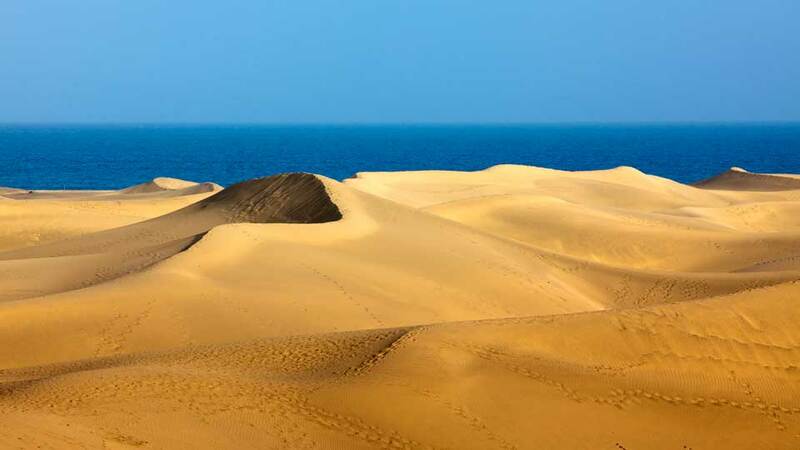 Amidst the massive development, the Sand Dunes of Maspalomas was declared a protected landscape by the UNESCO. A multitude of travelers, especially the Europeans, have one vacation destination, especially during the winter season. As temperature drops, the climate in the Canary Islands remains summer-like. 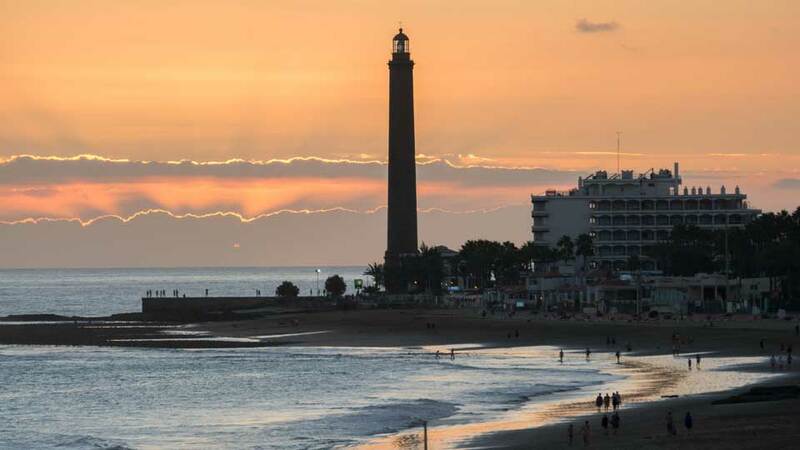 Under the silhouette of the imposing lighthouse, visitors become a part of the centuries-old memories in Maspalomas. Countless strolls, honeymoons, family vacations, and soul-searching trips happened across its 6-kilometer shoreline. Couples and lovers, even nudists and members of the LGBT community have found refuge on the beaches of Maspalomas and Playa del Ingles. The vast dunes, extending inland from the coast, hosts a plethora of endemic species. A stunning sunset is in store for guests at Dunas Mirador, where the picturesque sky becomes the perfect backdrop for the golden sand hills and deep blue water of the Atlantic. At night, the fun continues in one of the night bars in Meloneras or Playa del Ingles. While in town, there are a couple of parks to keep the kids entertained. Families could spend a lovely afternoon at the Palmitos Park. Or, as an option, they could find thrill and excitement at the Holiday World Amusement Park. 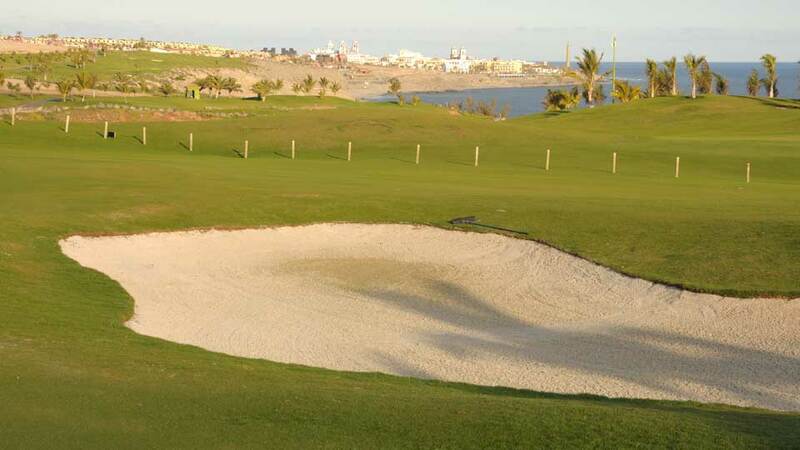 While ladies have a grand time shopping, gentlemen could tee off at Maspalomas Golf. Completing one’s stay on the island are the broad array of accommodations, most of which are on the upper scale. Aside from hotels and apartments, the town also has countless restaurants and cafes serving local and international cuisine. Although more popular for its beaches, the town of Maspalomas offers way more than the sea and the sand dunes. It is a haven for vacationers who want to indulge in a myriad of activities. 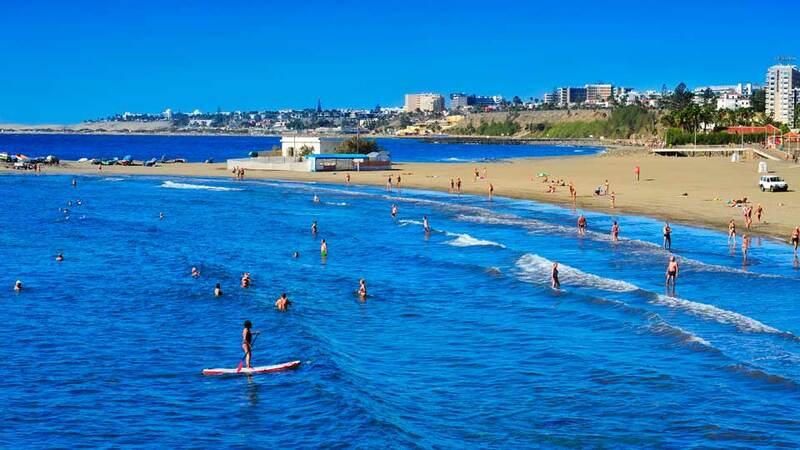 The long coastline in Maspalomas draws people in with sandy shores and cool waters of the Atlantic. Although the coast is long, the beaches are divided into smaller beaches, each with its distinct features. Starting at the northwest side of the legendary lighthouse, Playa de Meloneras competes pretty well with its neighbors. After a recent face-lift, it boasts of extravagant hotels, designer shops, and lots of seafront restaurants. Across the golden sand are sunbeds and parasols for rent, bringing beach comfort to the next level. The beach is ideal for swimming and sunbathing, although it could get rocky when the tide is low. A great activity for guests here is to explore the reefs and meet aquatic animals face-to-face during scuba diving excursions. At night, chill in one of the bars and cafes that light up and keep the shores of Meloneras fun and alive. 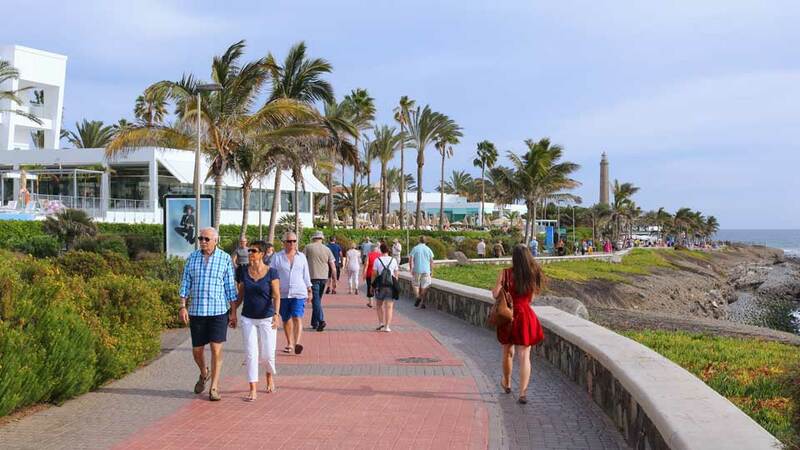 Walking east from the lighthouse, the tranquil beach of Playa de Maspalomas greets tourists. The 3-kilometer golden sand is perfect for lounging around, walking, or sunbathing. The water is calmest near the lighthouse, where shops and restaurants abound. Towards the midsection is a well-signed area for nudists and the gay community. Getting tanned does not have to be limited to the beach but also at the vast expanse of sand dunes. Walking further to the east from Maspalomas, beach-goers get blown away by Playa del Ingles. The busiest beach in Europe never feels crowded with yet again more golden sand and endless shops and cafes. It’s the top beach destination for those who thirst for nightlife by the beach. Commercial centers, high-rise buildings, hotels, pubs, and clubs dominate the shore. For that reason, it is a popular destination for those who love the modern amenities and the convenience of its location. An area at the end of the beach to the east is marked for nudists. From here, guests could also take a stroll on Paseo Costa Canaria, a long walkway with shops and beautiful areas for jogging, walking and even picture-taking. If the choice is to go to a much quieter atmosphere than that of Maspalomas and Playa del Ingles, then Playa de San Agustin is perfect. This peaceful beach is more popular with the locals, especially during weekends and is an ideal escape from tourist traps. That said, there are also plenty of accommodations to choose from, should visitors decide to stay and explore. The gentle waters of this beach make it a perfect place for snorkeling, and even scuba diving. When hungry, a couple of cafes, shops, and restaurants serve customers in its promenade. The sand dunes are the main tourist attraction of the town. With dunes resembling that of the Sahara, it has a raw beauty all nature lovers fall for. But for naturalists and those who simply want a break from the beach, Maspalomas offers a lot more than its magical sand. The Maspalomas Nature Reserve is divided into three sections: Dunas (dunes), Charca (pond), and Palmeral (palms). La Charca is a little lagoon which runs parallel to the walkway to the shore. Its pond is filled with fishes, and the landscape is, most of the time, visited by wild birds. 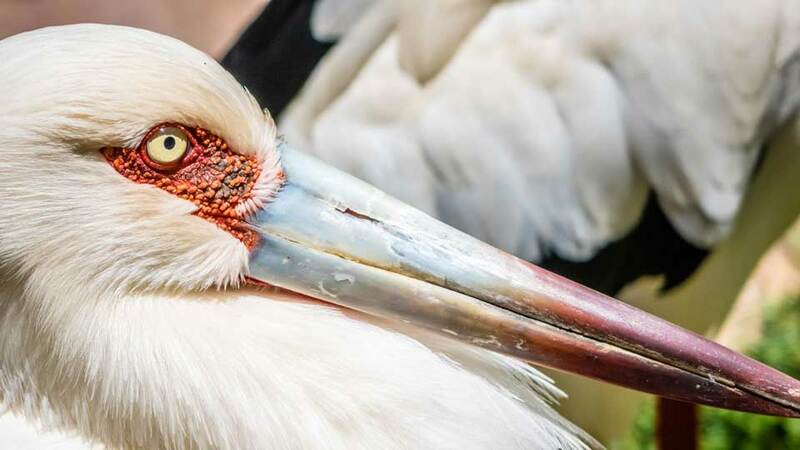 Grab some binoculars and have fun bird watching. Migrating birds from Europe heading to Africa usually rest in these waters. So, make sure to have your cameras ready in case egrets or herons decide to plunge in the water and fish for their next meal. Chiseled by winds blowing from all directions, the sand hills change every moment, making each visit a unique experience. And what’s the best spot to watch the enchanting sand dunes? None other than Dunas Mirador. This walkway and observation area was designed with a couple of low steps where people could sit. Here, guests could see the dunes forming waves of shadows as they welcome the golden rays of the sun retreating at the ocean-lined horizon. It’s a breath-taking experience, to say the least. Fancy a morning run or a quiet afternoon spent reading? Then this landscaped urban park in Maspalomas is the place to be. Lined with palm trees, it’s a shaded area away from the noise of the busy shops and beaches. Apart from the path for joggers, it also has a lovely pond. Unwind while watching the ducks, birds, and fishes go about their business. Or bring the kids and let them have fun in the vast playground. There’s even a local cafe which boasts of a reasonably priced weekend lunch BBQ meal for the family. Just like any desert, Maspalomas also has an oasis. But here, tourists will find more than just a couple of cacti or palms. Guests take a refreshing walk or a pleasant picnic amidst a vast collection of tropical and Mediterranean plants. The tranquility of El Parque Botanico de Maspalomas is something any traveler appreciate. The plant collections range from fruit trees like papayas and bananas to hordes of different flowers and shrubs. Visitors could even spot butterflies and birds. It is open on weekdays, and entrance is free. A tourist town is not complete without thrilling amenities for kids and the kids at heart. It is for this reason why families love Maspalomas. Close to the beaches are various theme parks offering hair-raising and adrenaline-pumping adventures. Palmitos Park is the consensus best recreational activity in Gran Canaria. Set amidst ravines and palms in Maspalomas, San Bartolome de Tirajana, the subtropical theme park is only a couple of minutes away from the beaches. It is where tourists can discover the diversified flora and fauna of Gran Canaria. Apart from the animal and plant attractions found in the zoo, Palmitos Park also has incredible animal shows. Visitors stand in awe as they watch exotic birds and birds of prey in flight. The famous dolphin show also brings smiles as the gentle mammals showcase their tricks and genius. Suddenly missing funfair rides? There is no need to fight the urge. Sitting inland between the beaches of Maspalomas and Playa del Ingles is Holiday World, an amusement park catering to all ages. Guests could ride the Ferris wheel and other fun fair rides. While there, friends and families could knock down pins in the bowling alley. The trampoline area should offer loads of fun for little children defying gravity. Holiday World is a fun place to visit both during the day or night. More nerve-wracking fun awaits the thrill-seekers in Aqualand Maspalomas Water Park. With over 30 slides, it is the biggest water park in town for adrenaline pumping action. Attractions are classified well so guests would not have a hard time choosing. There’s Chill Out and Play, Family Fun, Kidzworld, and Adrenaline Fun. Start slow with Pirate’s River or Jacuzzi, then crank it up with the Tornado or the Aquamania. Here, every slide is sure to bring out the laughter and fun for everyone. Millions of tourists come and go in Gran Canaria each year. From solo travelers to couples or lovers, many choose to fly direct to Maspalomas. Scattered across town are multiple mini-golf courses. But one of the biggest and most popular is the Maspalomas Golf Course. This 18-hole course has been a venue for a couple of international events. Enveloped by the dunes and natural reserve, with the trade winds fanning players’ faces from time to time, its prime location is more than ideal for many enthusiasts. For bodies that need pampering and 100% tender loving care, Maspalomas has got everyone covered. Spas and wellness centers thrive that it is impossible not to spot one on any of the beaches. The most popular and highly rated one in Playa del Ingles is Massage Gran Canaria Maspalomas. When in San Agustin, look up Thalassion Gloria San Agustin. Playa del Ingles and Playa de Meloneras are the go-to beaches for an exciting nightlife by the sea. Because of the numerous bars and clubs, many guests end up hopping from one to the other. In Yumbo Center, for instance, the Eiffel Bar serves the best cocktails in a relaxing ambiance. In contrast, tourists find a busy bar and outrageous shows in Ricky’s Cabaret Car. Not for the faint-hearted, many have raved about the awesome paragliding and parasailing experience with Sky Rebels. Fly like a wild bird for more than 30 minutes and experience Gran Canaria differently. Mediterranean, Italian, French, Canarian, Vegan, whatever it is that guests want, Maspalomas has a restaurant, cafe, or bar that serves it. All one needs to do is to walk along the promenade lining the shore in any of the beaches. Get ready to taste mouth-watering food from starters to desserts in the top-rated restaurant in Maspalomas, LoLa. Dig in on their Octopus Capaccio or Red Mullet, or satisfy a sweet tooth by ordering their Churros. The attentive staff and excellent service make the experience even more enjoyable. To cap the evening off, LoLa has an impressive list of wines. Wapa Tapa is another highly recommended restaurant in Maspalomas. Located in Yumbo Center, they serve some of the most delicious European, International and Vegan food dishes. Feel like a local and try their Tapas. Or heat up the cool evening with their Pumpkin Soup and savory Mini Chorizos. Do make a reservation as the place gets filled with hungry beach goers quickly. For a fill of Spanish and Mediterranean dishes, dine at La Palmera Sur. Also in Playa del Ingles and near Gold Hotel, this well-known restaurant boasts an attractive mix of dishes in their menu. Service is excellent, and food presentations are a delight both to the eyes and to the palates. After experiencing the beautiful town of Maspalomas, it’s hard not to want to stay longer. And finding a fancy place to stay is never a problem with the affluence of high-rise hotels in the area. Staying true to its 5-star rating is the Seaside Gran Hotel Residencia. The hotel, located close to the beach, has been a favorite among guests expecting first class amenities and service. The pool bar serves fantastic BBQ and meals. They boast of a spa, hot tub, fitness center, pool, restaurant, and lounge. The hotel premises are surrounded by palm trees and overlooking the mountains. It is also only a few minutes’ walk to the beach. Another 5-star hotel is Sheraton Gran Canaria Salobre Golf Resort which offers a fantastic view of the two 18-hole golf courses set amidst a backdrop of the sea and the mountains. Complete with pools, a gym, restaurant, bar and lounge, spa and a golf course, it is a vacationer’s paradise. An adult-only rooftop pool is perfect for those seeking to a dip in peace and quiet. A shuttle service is provided hourly for those who want to go down the beach to shop or swim. A lot of tourists have had a heavenly holiday in H10 Playa Meloneras Place. Located on the coast of Meloneras, it is a stone’s throw away from the beach and the shops. It also has easy access to the town. The hotel takes pride in its modern architecture as well as its friendly staff. Amenities include a tennis court, fitness center, pool, hot tub, spa, restaurant, bar, and lounge. For a plush hotel, it never feels too busy or too big. From the airport, it takes less than 30 minutes to get to Maspalomas by bus or taxi. Bus no. 66 takes guests to the town and costs less than 4 Euros. A taxi, on the other hand, would cost around 40 Euros to Maspalomas, or 35 Euros if heading to Playa del Ingles. When traveling within the town, most parks and points of interests are only a bus ride away. The standard fare is cheap at 1,40 Euros. The bus station is located near the lighthouse, with regular schedules to nearby beaches and towns. With a friendly climate, long stretches of fine beaches that kiss the Atlantic, and posh hotels and shops, Maspalomas is indeed a model tourist town in Gran Canaria. Add to that the multitude of activities for kids and adults, and a natural reserve that nestles endemic species, it’s a place that never runs out of fun and excitement. The lighthouse which has witnessed centuries of mesmerizing sunsets marks this dream destination. And with an increasing number of Europeans stepping into its golden sand, Maspalomas, together with its historic lighthouse, is sure to be witness to more memories under the sun.